Though the creators of Watchmen abhor the idea of further additions to its universe, the money generated by a movie spawned in 2009 could make a prequel or spin-off inevitable. DC Comics President and Publisher Paul Levitz has made it a point to nix any new Watchmen projects, including a movie sequel, because he believed they would be against Alan Moore and Dave Gibbons' (the original creators) wishes. The bearded Alan Moore has always been aggressively against his works becoming anything more than graphic novels, even refusing to accept any of the profits from the Watchmen movie. 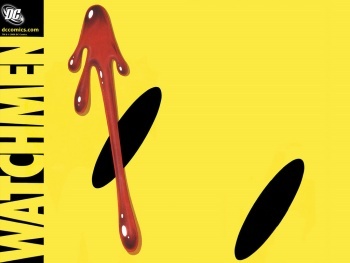 With Paul Levitz now stepping down from his position at DC, company Senior VP and Executive Editor Dan DiDio may be fast-tracking a pet project of his: more Watchmen. This doesn't mean a new movie just yet, but it does mean that one or more prequel miniseries or spin-offs could be in the works. However, if a movie were to eventually take form, all of the actors from Watchmen are already contractually obligated to return for a sequel. For now, DiDio wants to impress the fat cats above him by expanding on the Watchmen universe in comic form, which is almost destined to sell a massive number of copies. I know I would buy it, even though it would annoy the fanboy in me. Though DiDio has to give Alan Moore and Dave Gibbons first refusal on any such projects, their approval is extremely unlikely. We already know about Moore, while Gibbons has said in the past: "If you add anything to Watchmen, you're not adding to it, you're diluting it ... [The] general consensus, is leave well enough alone." Bringing one of the greatest graphic novels of all time to the movie screen is one thing, but adding to the Watchmen storylines already established with a miniseries, or multiple miniseries, could be a really bad idea. The only way I think it should be done is if Alan Moore himself came back to do it. Without him, it's not really Watchmen. Again, I'd still probably buy it anyway, even though it'd make me hate myself a little. Admit it, you would too, even just to see how Watchmen was ruined.